The birth of technology has transformed the lives of people to a great extent. It is used in almost all aspects of an individual’s life thus making it convenient. Connecting with friends and family at a global level is possible due to the Internet. With that being said, Recruiters can now connect easily with other Talent Acquisition professionals at a global and national level. In view of this development and to get more professionals to interact, share views and improve their knowledge in the process, Sourcing Adda’s next WhatsApp Group Chat focused on Dream. Well based on the aspects mentioned, I think it is safe to say that we all now have at least a brief idea as to how we would like our ATS to work for us. This should probably get all of us thinking about creating the perfect ATS. Let’s all aim to bring more people to interact and gain interesting insights. Be sure to join us for our next WhatsApp Group Chat. 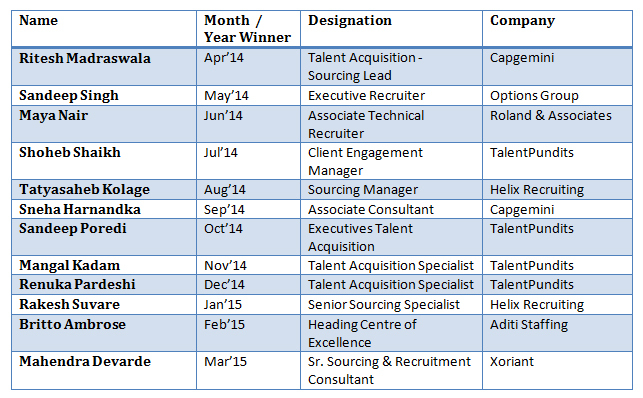 The Talent Acquisition and Sourcing Conclave (#TASCON15) that was held on April 15th 2015 in Pune was a smashing hit and the attendees walked away happy & excited about the excellent learning. In the Sourcing Lab we also had the Mega Sourcing Contest which we’ll come back to in our next post as our main focus in this post is on the Sourcing Lab – A practical insight into many aspects of Talent Acquisition & Sourcing tools & techniques presented by hands on experts from within the Talent Acquisition space. 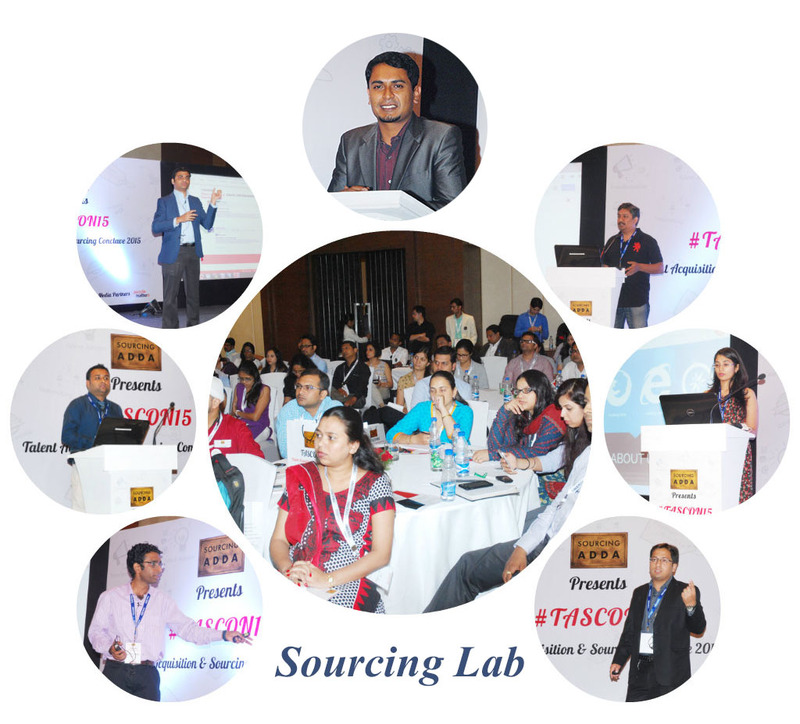 Sharath Kumar, partner at SourcePRO was the Host for the Sourcing Lab. The session began with comments to lighten the mood by sharing a funny Job Description that said “We’re looking for someone with the wisdom of a 50 year old, the Experience of a 40 Year old, the Drive of a 30 year old and the Pay Scale of a 20 year old!”. Sharath also mentioned that a Sourcer is like the Intelligence Agent of the Recruiting World! Think about it – Portal Intelligence to get active resumes and SOCINT, GOOGINT, TELINT to gather intelligence about a target while profiling him/her for a mission. We use MOBINT to attract the target to the mission and assess the fit using all of the sources I mentioned using HUMINT! Sharath had the crowd entertained by involving them in activities in between the sessions. This particular session had lot of takeaways. These simple tools that were shared will definitely help you to Source faster than ever before using Chrome extensions. The incredible tools were quite eye opening as they simplified the hunt for the Purple. This was another great session that conveyed important insights not familiar to the commoner. The next speaker to take the stage was Nitesh Kumar who spoke about “Company Mapping”. He simplified the understanding by explaining that Company Mapping is done basically to understand the structure of an organisation for competitive intelligence and to create a target list. He also provided alternative uses of Company Mapping to boost the process. An amazing session that was a hit with the delegates due to the insights shared. The other tools that one can use are LinkedIn & Facebook and even Twitter, Meetup & Google+ where you can send direct messages to a particular person. Well this brings our recap of the Sourcing Lab @ TASCON15 to a close. and knowing If you’re interested in getting hold of the PPTs then visit TASCON or SlideShare. Stay tuned with #TASCON15 for updates that prove how impressive the entire session was. Have you taken the time out to look? Have you completely searched you’re database? Have you written a Boolean Search String with all the required information filtered? Have you done an advanced LinkedIn Search? Have you done a Monster search or any other job portal? Have you checked Social media like Facebook, Twitter etc.? Have you contacted current and past employees for referrals? Have you got in touch with influential people? You get the picture, need I say more? Do you send In-mails to everyone that meets one keyword of the job spec by using LinkedIn or any other networking sites but haven’t tailored it according to the candidates you’ve sent it to? 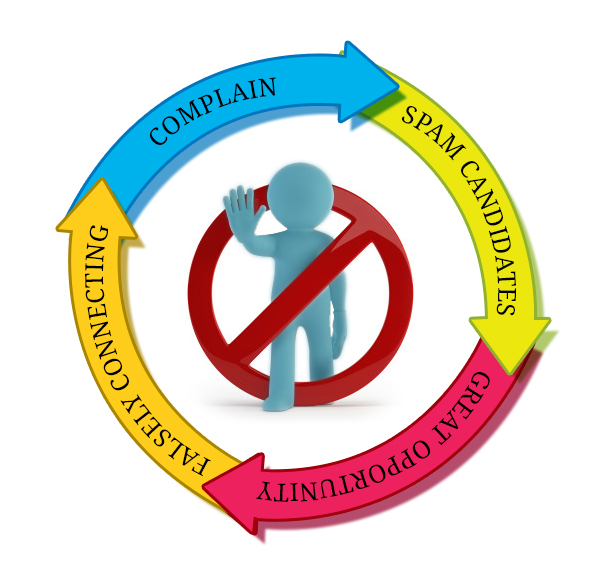 If that is the case then it will definitely affect your chances of establishing contact with potential candidates. In such a scenario it is important to note that individuals respond better to personalised contact as compared to a generalised one. Another common method used by many Recruiters is having false connections. When we wish to establish connections with individuals, the general tendency is to say things to get them to listen to you. The most common statement used is that you’ve done business together although that may not be the case. Once rapport is established a connection is made. This is done by almost every person on LinkedIn that is seeking a candidate. In order to get the most response it is important to stop developing false connections else you’ll lose connections rapidly. You’ll have the opportunity to experience X! You can take the opportunity to learn Y! So on and so forth, does this sound familiar? Therefore, if you’re following these statements in your job specs then you might want to stop because no one really responds to such statements. There you have it the aspects that can make a difference. These are but a few habits that Recruiters follow which affects their efficiency on the whole. Therefore if you wish to be a good Recruiter instead of an average one, you need to first identify if you’re following any of these habits and avoid them. This will in turn improve your hiring percentage and land you with the right candidates. Do you have any ineffective Recruiting habits you’ll like to add? Now let’s get back to the interesting conversations and in the process boost our knowledge about the same. Here’s what was discussed…. Now isn’t this great? We’ve got some amazing inputs and techniques that we can all use and help each other. Well we’ve actually upgraded ourselves to new techniques that haven’t been thought of before. A big thanks to all our participants and we hope you continue to participate and share your insights. Got any topics for out next WhatsApp Group Chat, do tell? 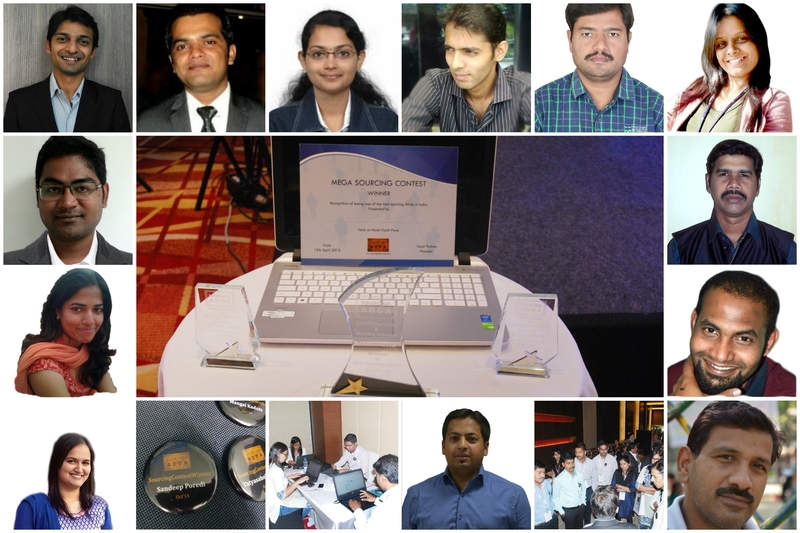 Those of us who were present would know that the Mega Sourcing Contest was the grand finale of the Monthly Sourcing Contest that was held for the duration of 12 months. This Contest began in the month of April 2014 and ended in March 2015 with the winners gaining entry in to the Mega contest automatically. The contest commenced with the contestants all fired up for the next big challenge having successfully completed the first challenge in the Sourcing Contest. Before the contest began they were briefed about the rules, regulations and procedure of the Contest. It was divided in to 3 milestones where the 1st milestone was to search for the target individuals name and email it to the organisers. After which they would be sent an email containing clues to complete the 2nd milestone. They had to use the information they gathered in the previous milestone and the 3rd milestone was a webpage. At the end of the event the participants were presented with mementos to mark them as the finalists of the Mega Sourcing Contest. Unfortunately it wasn’t solved as planned by the organisers due to the difficulty level in spite of them putting in their best efforts. The contest wasn’t completed as expected hence the team decided to reward the first individual to solve the 2nd milestone. Therefore Britto Ambrose was declared the winner and presented with a certificate, an award and a slick hp Laptop. To those who were present, I think it’s safe to say that overall it was an amazing contest where the participants put in great efforts and was enjoyed by all participants including the host. The competitors displayed great sportsmanship and were not defeated just yet. The responses, reviews and feedback that Sourcing Adda received were accepted. The views thus expressed were considered and the decision was made to conduct yet another contest. To get updates of future activities and to participate in another amazing contest follow @sourcingadda. Be prepared for another year of fun and amusement that is sure to blow your mind. In all earnestness we request you our patrons to give suggestions for future activities and blog topics to come. I request everyone to check in for a newer and bigger version of the contest in June.